We provide reliable AC repairs our clients depend on. In Southern California, you need your air conditioner to work reliably. If your AC needs repairs, now is the time to take care of it. Call us for air conditioning repair services for your business or home to keep everyone cool on those hot California days! Enjoy peace of mind with expert AC repair services! Admit it: you weren’t thinking about your HVAC unit until something went wrong. Unexpected high temperatures crept up on you and took your air conditioning down. You’ve spent the last ten minutes with your head in the fridge to cool down, but now what? It’s time to call R&R Heating and Cooling for air conditioning service and repair! Some units slow down as they become dirtier; others have just been providing cool air for your home or business for far too long. Our AC repair process includes thoroughly assessing all components, answering any questions you may have, and cleaning up when we are finished. We’ll take a look at your air conditioning unit and diagnose the problem. If it’s a quick fix, we’ll handle it on the spot. If your AC unit has bitten the dust, we can handle that, too. 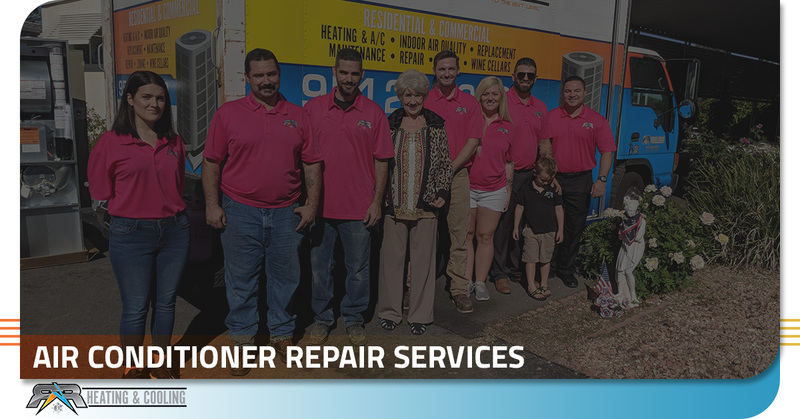 Our mission is to help you relax when your air conditioning unit seems to be falling apart. We will talk you through everything so you have a clear understanding of the issue, the solution, and the cost of repairs. We service all types of cooling systems and their various components, including thermostats and outside units. Don’t be afraid to ask for what you need from our team. 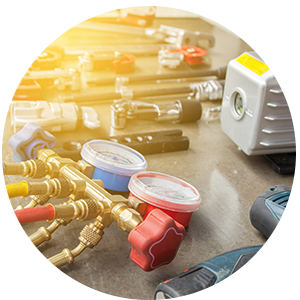 At R&R Heating and Cooling, our experienced, highly trained HVAC technicians can diagnose and service all brands and models of air conditioning units and systems, for both the residential and commercial sectors. We fully understand that in Southern California, particularly in the inland communities like Palm Springs, Temecula, and Anaheim, reliable cooling is important any time of year. It can be in the 80s and even 90s around the end-of-year holidays! Reliable air conditioning is a must, and we are here to ensure you and your family (or you and your employees, customers, and business associates) have the cool air you need to stay comfortable. Let us get your AC unit running smoothly again. Sit back, relax, and let our team help you cool down when things get heated. 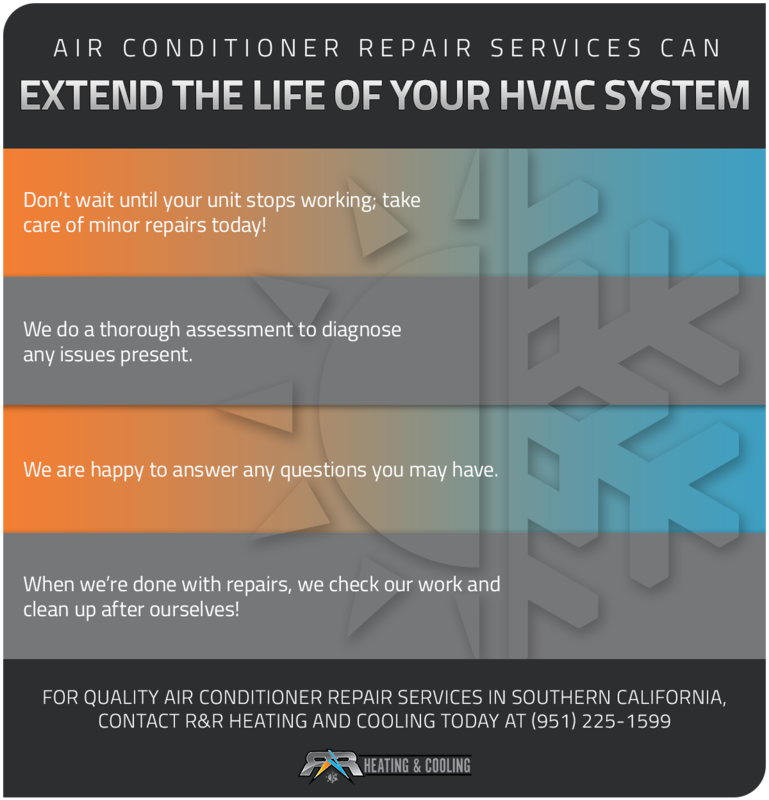 Contact R&R Heating and Cooling in Southern California, serving Temecula, Anaheim, Irvine, Palm Springs, and the surrounding communities, for help with your air conditioning service and repair needs. Call us today!